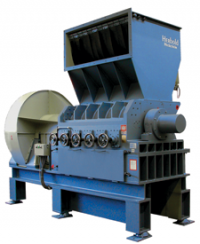 Wet granulators are granulators from the Herbold SMS or SML series that have been modified for the use of the simultaneous washing and size reduction of soiled feed material such as film scrap, old battery cases, bottle crates, etc. 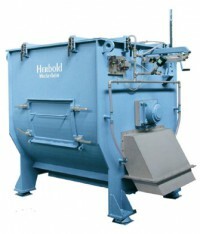 The Herbold Friction Washer is used to wash highly contaminated film flakes. They are used for discharging treated material mixed with water from a wet grinder. This also can be used in special cases where the friction washer can be installed in front of or after washing tank and hydrocyclone units. Swim-sink tanks use the different specific weights of the various kinds of plastics to separate them. Typical applications are the separation of PET or PVC (both sink) from polyolefines, such as PE or PP (both of them swim). The light fraction is transported along the surface of the water by means of paddle drums to a discharge conveyor; the heavy fraction are extracted - depending on its amount - either by a pair of pneumatic valves at the bottom of the tank or by a scrape conveyor mounted below the tank. 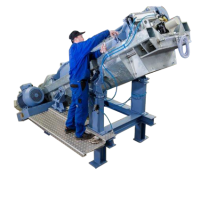 The pre-washing unit VWE 600/2 combines the function of a heavy material separator with a pre-wash of the feeding material. The Herbold pre-washing unit separates foreign bodies such as stones, metals, glass, sand and paper using three different integrated process steps. 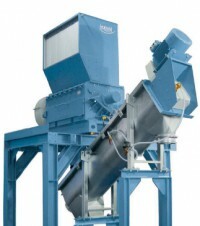 The feed material undergoes an intensive washing step and then, in a third step, makes further foreign materials sink. 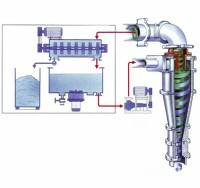 Hydrocyclones are used for separation where greater efficiency is required than what is achievable with swim-sink tanks. This unit can be used as a dryer or as an intensive washer. 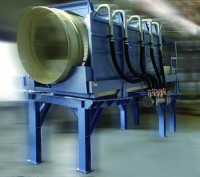 The Mechanical dryers operate as a centrifuge for film, regrind and mixed plastics. The wet fractions and the fines are mechanically dried in this centrifuged dryer and at the same time the contaminations are removed by the high impact energy and then will be evacuated. Herbold PET Hot Washing Lines transform highly contaminated PET bottles into high-quality grade material.